I tend my garden every day; weeds offend me—deeply—as do dead leaves and dying flowerheads. I find it easier to keep on top of problems, like squash bugs and hornworms, than deal with them once they’ve taken over. Not everyone can devote the time or energy required to tend their garden this way, and I know how fortunate I am. My tending tendencies are also temperamental. I cannot let things slide. 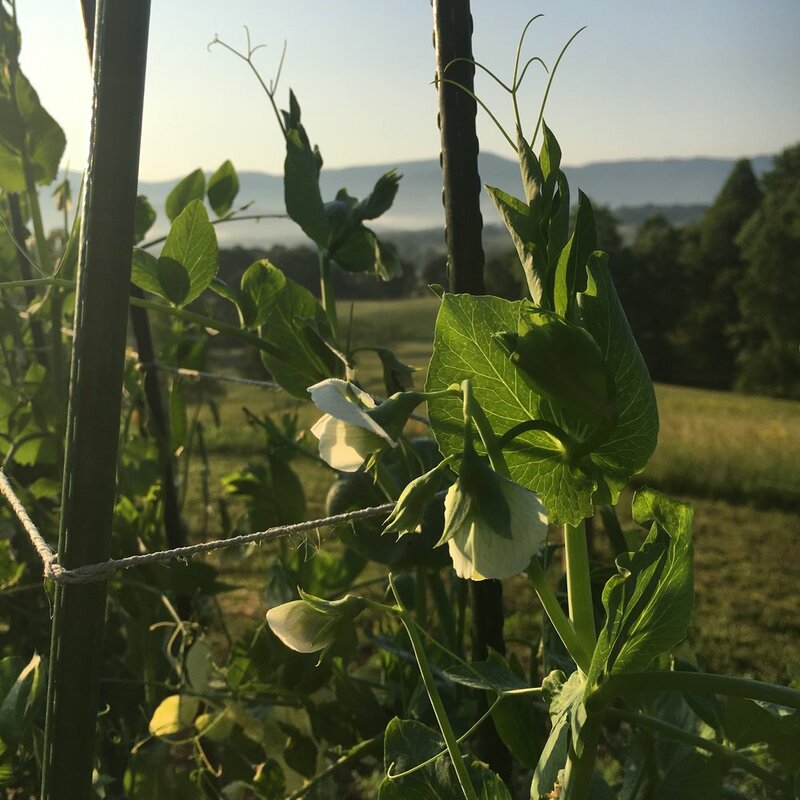 Here in rural Virginia, most folks grow the same thing--tomatoes, cucumbers, summer squash, and watermelon—and do it by throwing seeds on the ground and walking away. In a typical year, casual gardening works remarkably well. This summer has been relentlessly hot and humid, with inconsistent rain, and even my garden, coddled and spoiled, has stumbled. Case in point: after a strong start, my zucchini and yellow crookneck squash shriveled up and died, almost overnight. Summer without squash? Impossible! Not to be defeated, I planted more yellow squash in a different spot about six weeks ago, and I’m pleased to report they are doing beautifully. The bean season was too short, undoubtedly due to the weather, so I replanted both purple French velour and Algarve beans at the same time as the squash. As the tomato plants become straggly and the rest of the garden winds down, it’s refreshing to see bright green leaves and colorful blossoms again. If you’ve been following along, you might recall that I was awaiting news from my publisher about my next book. Well, like the squash and the beans, I’ve been granted my second chance, not for one more book, but for two! Stories We Never Told will be published early in 2020, and the next one…Never mind. I can’t think that far in advance; I have a book to write! That’s my life for now: making my daily count of one thousand words and tending my garden. (And cooking and storing the harvest, of course.) My garden and I are in stride, making the most of our second chances, approaching the next season with renewed vitality. Getting a first draft down is daunting business. I am hypercritical of everything and yet must stop myself from fixing things. Essentially, I tell myself to shut-up every few minutes. But like most endeavors, if you keep at it, you will get there. So I write, and put my faith in eventual magic. Winter is coming, but not quite yet. The squash, the beans, and I have work to do. Now that Buddy’s back on his favorite plum tree, serenading us every dawn, summer is officially in full swing. And, boy oh boy, did the weather gods get the memo. We’ve been in monsoon mode since mid-April, a time when the norm is 75 degrees and crisp spring air. It’s sticky and icky. Luckily, my constant presence is not required in the garden this time of year. Sure, I potter around, pulling the odd weed, harvesting a few sugar snap peas, lettuces, and the last of the asparagus. But most of the plants are in growth mode and all I need to do is stand to the side and admire them. In a month’s time, I will be inundated with produce and my kitchen will resemble a factory. I’ll be cleaning, chopping, freezing, blanching, canning and jamming! But not yet. Because art imitates life, my writing is in much the same place as my garden. I’ve dealt with the copyedits and proofreading of True Places, my next book, and am awaiting the final cover. (!!!!) Since, well, forever, I’ve been working on What Comes Next—two projects in fact, to be submitted together, like a twofer. One of the proposals, a story of obsession and fraud, is pretty much good to go. The other, an immigrant/ WWII story, is almost there. Once my agent submits the proposals, there will be nothing to do but wait for what we hope will be a green light on one or both projects. And then I will, you know, have to write a book or two. Any bets I hear from my editor when my garden is generating 20 pounds of produce a day? Good thing I love my work, both in the garden and at my desk. In the meantime, I have reading to catch up on, and daydreaming, too. Isn’t that what summer has always been for? Long, carefree days when your bathing suit never dried, you ate lunch in a treehouse and stayed up late playing tag and chasing fireflies until, at last, you were called inside by your exhausted parents. What are you looking forward to this summer? Homegrown tomatoes? The beach? Freeze tag? It’s 32 degrees and sunny this morning in my corner of Virginia. Compared to the bitter cold of late December and early January (the dreaded bomb cyclone), it feels positively balmy. In an earlier post I wrote about how I’ve been hoping for a wintery winter to provide atmosphere for my work-in-progress, The Snow Cave, so perhaps the cyclone was my doing. Sorry about that. Like most people (but, sadly, not all), I was snug in my heated home and car, and could bundle up when I had to go out. Wild animals had no such luxury and I thought of them often. I also worried about our bees. We have two hives: Bees and More Bees. We did everything we could to help them through the cold. My husband had already installed a wind break and encased the hives in foam insulation. We left them with plenty of honey and gave them sugar cakes just in case. But, in the end, it was down to them. The population is about 60,000 bees during the summer but drops to less than 30,000 in the fall, losing more numbers over the winter. The overwintering bees form a ball around the queen and vibrate to keep the core at 80 degrees. That’s a lot of buzzing! Imagine how hard it must be to keep the queen that warm when the temperature drops below freezing, even below zero, and stays there. As we watched the bees from Bees returning to the hive, we noticed their pollen sacs were full. You can see the full sacs on this girl, harvesting pollen in the garden last summer. But where were the bees finding flowers in the dead of winter? Something must have been blooming and those clever bees discovered it. As we pondered this mystery, we remembered our tiny lemon tree in the greenhouse was flowering and moved it outside. Within a half-hour, bees from Bees had found it. Amazing! The loss of one colony made it clear just how dicey the whole endeavor is and sharpened my appreciation for the endurance of the other. Isn’t that how it often goes, though? A blow to the ego, a lost love, a broken friendship, and a bomb cyclone have pretty much the same effect: the next upswing seems that much sweeter. This isn’t news and it isn’t deep but somehow it’s something I need to remind myself of again and again. We’re heading toward spring, Bees! Hang in there. Gardening and writing. Writing and gardening. It’s what I do and what I have done for most of my life. I’ve had many other pastimes and a couple other careers, but the common thread has been growing things and making words fit my thoughts. Have you ever heard authors say they don’t understand their books until at least the first draft is complete? The same is true about understanding ourselves, I think. The first draft of my self was written a long while ago and I’ve been undertaking extensive revisions since. Looking back at the process, my attachment to gardening and writing reveals something deeper about me, as any decent theme should. I’m on a quest for two things: patience and humility. Ask anyone who knows me and they’ll agree I still have a ways to go. Okay, so I’m a work-in-progress! That’s the scaffolding for these new posts. 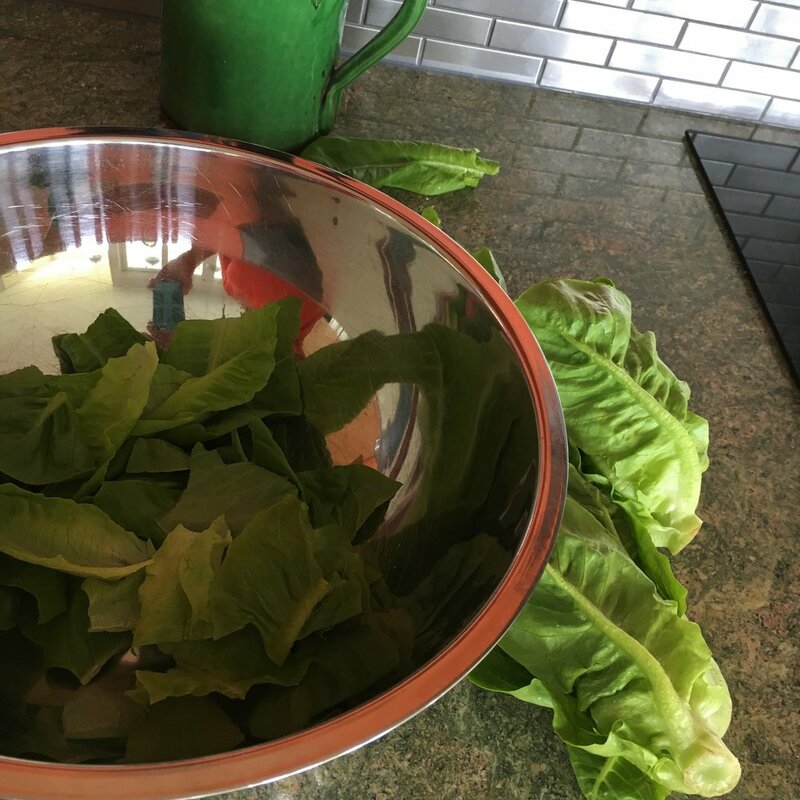 In truth, I will be light on philosophy and heavy on news from my vegetable garden, orchard and berry patch and how I’m using the bounty in my kitchen. We will talk FOOD. Beautiful food. That’s a kohrabi, by the way. Normally green, I grow the purple variety. I’m all about eating all the purple things but perhaps we’ll talk about that more another time. 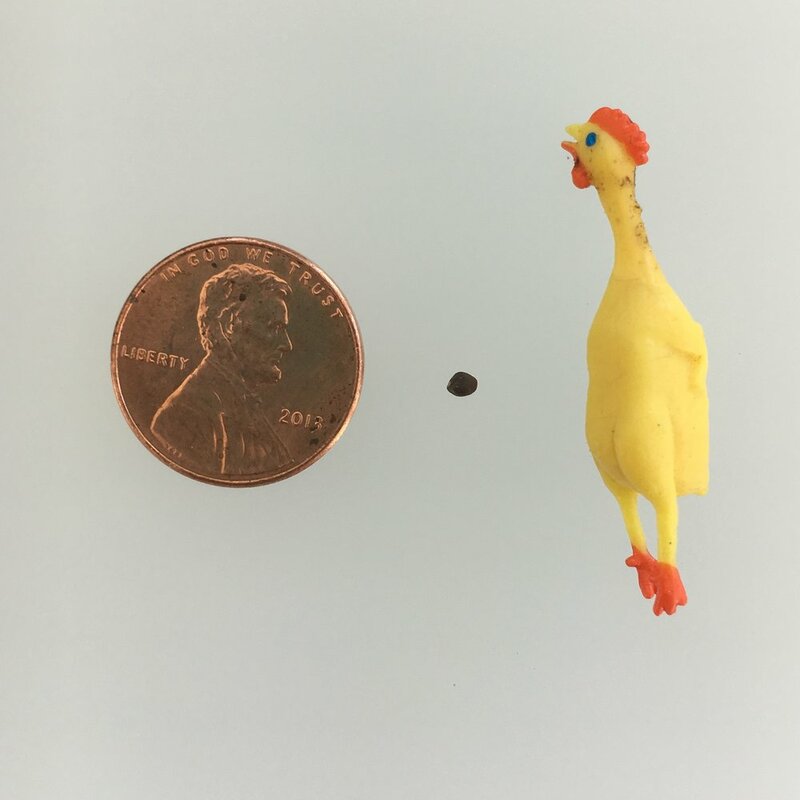 I know you are still wondering about the world’s smallest rubber chicken and quite possibly are overwhelmed. I know I am and I’ve had it for years. Until next time, then. Grow yourself. Eat well. Use your words and use them like the miracles they are. Something strange has been happening in my garden and it's got me thinking. Not surprising, really, because the garden is a beautiful place to have a ponder, and lately, when beauty and grace have seemed in short supply, I'll take it wherever I can find it, even if it means weeding. Like much of the East Coast, our unusually warm summer has segued into an unusually warm autumn. Our first frost is four weeks behind schedule and counting. Raised in a Vermont snowbank, I'm one of those freaks who loves the cold, but even so you won't catch me complaining about this weather. Because instead of succumbing to brittle brown dormancy, my garden thinks it's spring. Seedlings are popping up everywhere, fooled by the warmth into putting down roots and reaching for the sun. A veritable forest of baby dill! I belong to the Tall Poppies Writers, a collective of smart, energetic, talented women authors, and grew poppies from seed packet the members received at last fall's conference. In early summer, they bloomed magnificently and when the winds blew and the rain lashed down, the tall slender stem leaned on each other, just as they were meant to. Every time I saw the flowers, I thought of my Tall Poppy sisters, and was heartened. These seedlings won't have time to bloom but I know I will see them in a few months time. The weather has not only been warm, but also extremely dry. 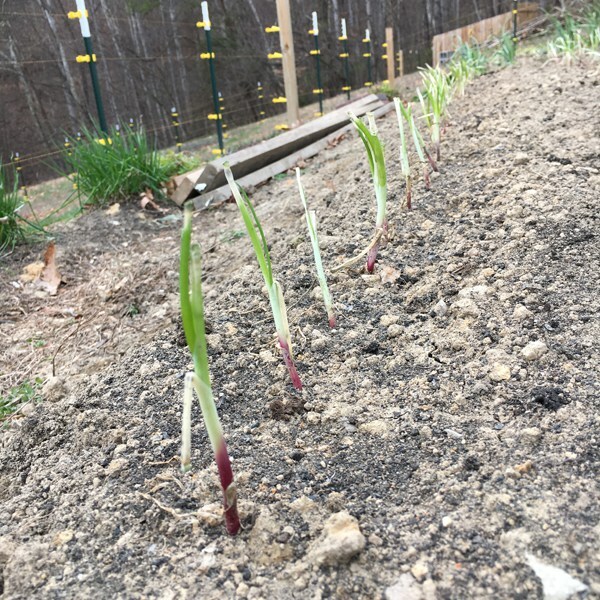 Every few days I water the fall vegetables I planted and take a few extra minutes to include the brave, misguided seedlings. I can't help it. And that's what got me thinking. A little extra warmth was all it took to make November feel like May. Most of it happened without my intervention, but sprinkling some water now and then has made a difference. Not everything will bloom again; most will need the patience to wait for spring. But the seedlings themselves give me hope and remind me it won't be brown and dry in the garden forever. Just look at the bouquet from my November garden. Like you, I've been appalled, dismayed, angered, and disheartened by acts of hatred, stories of abuse and crimes against decency over the last several months. On this Election Day, I'm taking a lesson from my garden. The days may still be getting longer, but with a little warmth and a sprinkling of generosity, we can't help but grow, lean on each other, and reach toward the sun. The two hives of bees we installed in April are doing so well we decided to steal some honey from More Bees. (Want to start at the bee-ginning? Go here.) When we visit the hives for inspections, we use smoke to calm the bees. That's not appropriate for honey harvesting because the first thing the bees do when the fire alarm goes off is poke open the capped honeycombs and fill their honey stomachs. Don't you do that when you smell smoke? Instead, we spray a felt-lined fume board with an almond oil concoction which drives the bees off that layer further into the hive. Worked like a stinky charm! Here is a single frame completely full of capped honey. Capped honeycomb is not always pale; it depends on what the bees were feeding on. This frame has lighter honey at the top and darker at the bottom, showing how as the flowering plants change, so does the honey color. Here's a close-up where you can see the color variation. Pollen is every color you can imagine and it does not necessarily correspond to the flower color. For instance, the borage flower is a gorgeous periwinkle blue and the pollen is grey. We stole six frames, gave More Bees six fresh ones and high-tailed it to the garage. That medieval tool you see my husband employing below punctures the waxy caps of the honey cells. The extractor is a centrifuge; two frames go in at a time. It's meant to be hand-cranked but my husband got the brilliant idea of using a hand drill to speed things up. The honey gets thrown out of the cells, hits the wall of the extractor and runs to the bottom. Bits of comb inevitably get mixed up with the honey and need to be strained out. Ta-da! Isn't it gorgeous? We extracted a quart of honey from each of the six frames and will keep a couple of the larger jars in reserve in case our bees need some over the winter. We hope they will have stockpiled the fifty pounds they need themselves, but we want to be sure. Thank you, More Bees! And thanks also for pollinating our garden in the process. What a miraculous creature is the bee! I've clawed my way out from under an avalanche of summer squash to give a progress report on the garden. We've come a long way from the plotting and planning stage two months ago. Here's the overview. The sunflowers (Velvet Queen) are over seven feet high.That's borage below. The bees love and so do we; it's edible. We're growing three kinds of beans: Kentucky Blue pole beans, Romano bush beans and French dwarf purple velour beans. Intermixed are Limelight Four-o'clocks which help keep pests away from the beans. Japanese beetles are attracted to them in particular. If they nibble, they die! These flowers are not hardy so I will dig them up in the fall and store the roots. The ten tomato plants are testing the limits of their cages and you can see the fruit near the bottom. Those two are Hillbillies, one of our favorites from the last two years. The red onions are bulbing nicely. Melon (French Chanterais) and summer squash (Delta crookneck) taking over the world, per usual. We're also growing Delicata squash, Early Butternut and Lambkin melon. Delta squash blossom with a bee inside. My husband built this attractive ladder for the Eureka cucumbers. They are interplanted with nasturium and dill (BFFs). I made my first batch of bread-and-butter pickles yesterday. As wonderful as the vegetables are, it's the flowers that make me smile, especially these poppies, a daily reminder of my friends at Tall Poppy Writers. I would be remiss if I didn't acknowledge my 50,000 little friends who helped make the garden such a success. Thanks, Bees and More Bees! One final shot so you can see why working in this garden is hardly work. How's your garden faring? 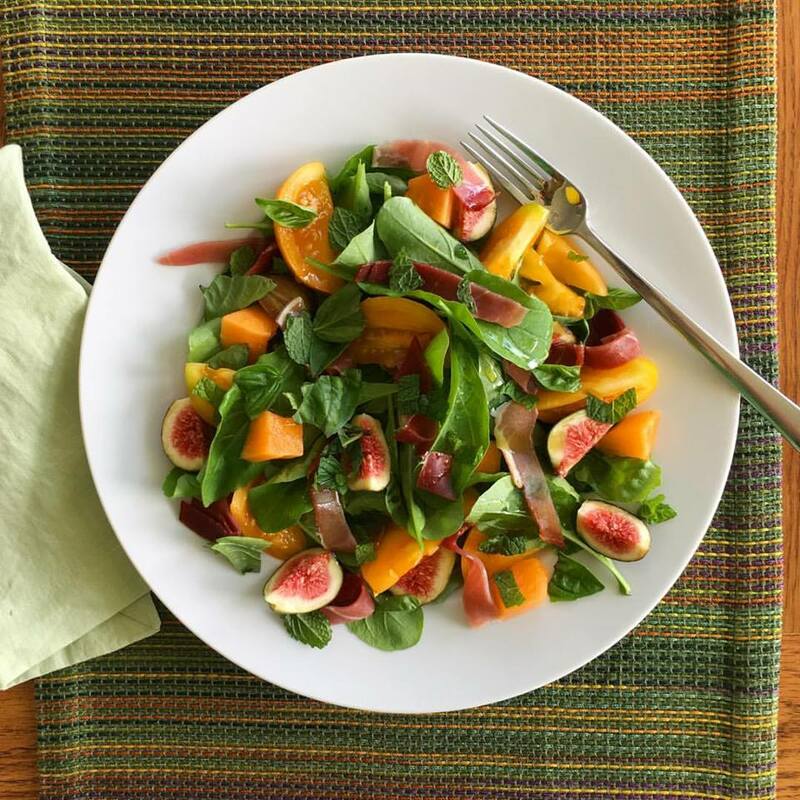 If you don't garden, what are you enjoying most right now from the farmer's market? You're all too young to remember, I'm sure, but there was a hilarious show called Green Acres about a couple, played by Eva Gabor and Eddie Alpert, who move from Manhattan to Hooterville for the farming life. My love of pigs undoubtedly stems from the show, which featured on occasion the "son" of the Ziffles: Arnold, a very intelligent pig. Here's Mr. Douglas on his John Deere. We don't have a tractor, but homesteading is nevertheless proceeding apace. As you can see, the greenhouse is replete with new life. I transplanted some of these darlings into the garden yesterday, so of course today it's been pouring nonstop. Luckily, the garden is on a slope. It's puddly! Potatoes are on the right. Those white domes are row covers--translucent cloth that keeps the bugs off plants, in this case the crucifery. What? Didn't you pay attention two posts ago? Cruciferous vegetables are cabbagey things. Shall we take a peek under the covers? Look how happy they are! This trick won't work for every vegetable because some need pollination, like tomatoes and cucumbers. But if you're eating the leaves or the roots or the pre-flowers, or the roots, it's an option. It's a little warmer and more humid under there, which can also give plants a boost. As big as the vegetable garden is, it's smaller than our ambitions. This plot, between two retaining walls, is ready for figs, herbs, flowering shrubs and berries: raspberries, blueberries, blackberries, currants and gooseberries. I am a berry fiend and cannot wait for this to get going! It's still raining in sheets as I write this but eventually the sun will return and those little transplants will start getting a grip. In the meantime, here's a sunrise shot from the other day. As Mr. Douglas said, "Green acres is the place to be!" To all the moms, have a wonderful Mother's Day! Yesterday morning the post office called to say our bees had arrived, so we jumped in the car, excited as little kids. We'd decided to become beekeepers last June while hiking in the Pyrenees, where it seemed every house had a couple of hives out back. In October, we'd ordered the bees as an anniversary present to ourselves. Finally the bees were here! My husband gave me this lovely card before we left to pick up our charges. We put the bees in the basement where it was cool and dark and sprayed them first with water, then with sugar syrup, which had a calming effect. Don't try this on your children, however. In the late afternoon we were ready to move the bees into their hives. Notice the electric fencing. Bears are around, and we all know about bears and honey! The queen for each package arrived in a cage, which included a few attendants. I thought I had a clear shot of the queen (she is marked with a tiny white sticker), but a bee photo-bombed it! We removed a tiny cork from the bottom of the queen cage to reveal the candy plug. The bees will eat the candy, releasing the queen into the hive. The moment of truth. Richard dumped some of the bees over the queen and the rest in the open space we created by removing a few of the honeycomb frames. Here Richard is replacing the frames--slowly, so the bees move out of the way! The bees were very busy but not at all aggressive. That strip of metal is supporting the queen cage. When we check the hives in a week's time, we'll make sure the queen is out and remove it. In addition to provide our spoiled bees with ready-made honeycomb and hand-painted accommodation, we started them off with a stocked pantry--a gallon bag of sugar syrup. A few bees showed a keen interest in reading the beekeeping manual and were shocked to learn we plan to use a smoker the next time we visit. Success! We'll leave them in peace for a week, then see how they are doing and give them more syrup. There may even be some eggs--more bees! Happy spring, everyone, and have a bee-utiful day. We moved into our new house! Nearly two years in the making, we are, at last, in our forever home. The furnishings are sparse, and there is some finish work to be done, but that didn't stop us from heading straight outside to work on our garden. For us, the garden--and the orchard and the fields and the woods--are as integral to our home as the kitchen or the laundry. On a day like this, who wouldn't choose to be outside? That's the rototiller guy. Isn't he cute? The rototiller is called Attila, of course. You can't see how large the garden area is from this angle, so here's a shot from the deck. Rototiller guy is still at it! And would you look at those redbuds. A garden of this size requires a plan. I started with a border of flowers, then divided the rest into twelve 4-foot by 16-foot beds, with walkways in between. The flowers have been selected for their pest control properties, their attractiveness to bees (Next post! So excited!) and general loveliness. As I worked this out, I realized the parallels to sketching out a plot, not of dirt, but of words. Just as in writing, once I established the basic structure, I fleshed it out. Warning! If you are not interested in plants, you might want to come back for the bee post next week. This is vegetable planning at the level of Badass. I divided the sixteen planting areas into four groups of three: one for nightshades (tomatoes, peppers, eggplant, potatoes), one for legumes and light feeders (peas, beans, carrots, lettuces), one for crucifery (cabbage, broccoli, cauliflower, chard, beets, kale) and one for curcurbits (squashes and melons). Why? Because diseases and pests tend to plague members of the same family, so each year I'll shift the groups over one column. I dare the baddies to follow! In veg-speak, this is called crop rotation. Riveting, huh? But there's more. Asparagus gets its own bed because it's going to stay there for twenty years; eventually I'll be mashing the spears with my dentures. Also, you'll notice numbers under some plants, like carrots and arugula. Those are succession plantings. I'll seed a few rows every couple weeks so we're not buried under a pile of carrots in a single week. 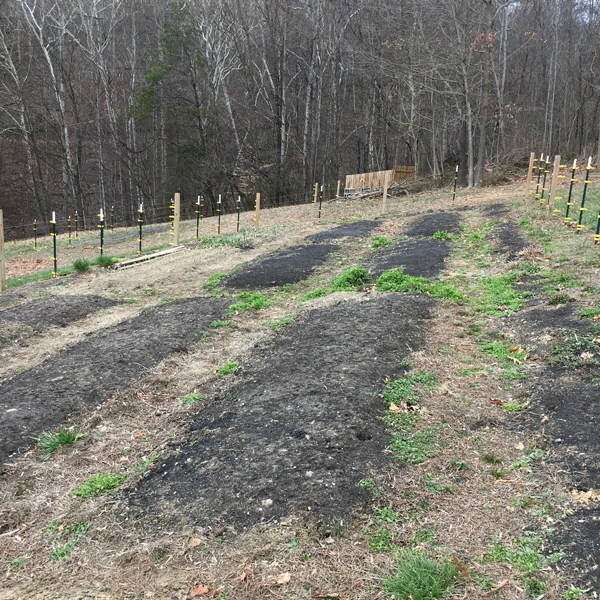 I like complicated plots, so I'm adding yet another layer to the design: companion planting. Did you know plants have friends (and enemies)? Cucumbers like to hang out with nasturtium, and tomato adore basil in the garden, as well as on your plate. Beets, on the other hand, would like to wrap beans around their stupid poles and snap their heads off. Designing a garden at this level is like creating a seating chart for a Mafia wedding. If all goes well, I hope to have a harvest as glorious as this one from my California gardening days. I'll keep you posted. Meanwhile, I'll be plotting, and planting, and maybe, just maybe, I'll sneak a little writing in on the side. 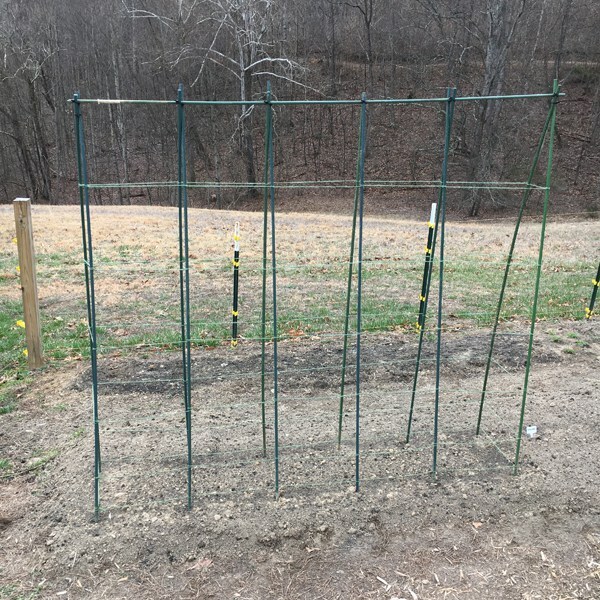 I've been itching to write this post for a while, because I'm so excited to tell you the news: we planted an orchard! Yup. In November, we drove the truck to Edible Landscaping in Acton and hauled twelve fruit trees home: three apple varieties, three pears, two cherries, two plums, a mulberry, and a persimmon. Here's what it looked like after we got them in the ground. What trees, you say? Yeah, you have to zoom in. They are tiny! But that's the best way to start. You can see my husband, digging the last hole. And, YES, I dug, too. I actually dug more because he was doing the technical work of installing the electric fence. I'm the grunt. Each tree received a circle of hardware cloth to protect the trunk from nibbly mice. The electric fence is for deer (and groundhogs) but I read that it is best to train the deer. Animal behavior--right up my alley! The idea is to attract the deer to the fence. I know, it's counter-intuitive. But if they see the white flags, they march over to investigate and...ZAP! I'm not a mean person, I just want apples. The deer are free to forage over our remaining 40 acres. Also, I put aluminum foil on there, smeared with peanut butter, in case they missed the white flags. According to what I've read, and basic principles of conditioning, a single zap should keep them away for a good long time. Of course I don't know for sure that the deer came over to the fence for their lesson. However, after the recent snow, I did check to see if there were any tracks nearby. Those little buds would've looked mighty tasty. But, no, not a track in sight. Success! We do worry about our trees. Those spindly guys look awfully vulnerable. There's a saying that the best time to plant an orchard was 25 years ago, and the second best time is now. It may not yet be a thing of beauty, but planting our orchard was an exercise in hope. And even on a snowy winter's day, there is warmth in that.